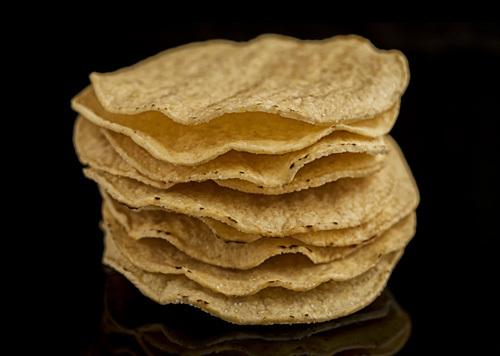 In Mexico, the tostada is a golden tortilla of crispy consistency and rough texture . It is a simple food but it has various applications in the Mexican cuisine. The tostadas are used to accompany Mexican dishes like a tasty pozole , a ceviche or several appetizers. Although the tostadas’ function doesn’t end there because they are also used to cover them with mountains of ingredients like the tostadas with sausage and potato , the crab tostadas , the chicken tostadas , etc. – The tostada is quite similar to a tortilla chip. The difference is that the tortilla chip is cut into triangles and the tostada consists of the whole tortilla. You will like this recipe because it is easy to make and cheap. Preferably use old tortillas in this recipe because they will brown better and the tostadas acquire a better consistency. Preparation time 12 minutes . We give the recipe for 6 tostadas. Preheat the oven to 355º F.
Moisten a pastry brush with 1 tablespoon of vegetable oil and varnish the superior part of a baking sheet, until it has a small oil layer that covers the baking sheet. If you have cooking spray it can also be used to spray the baking sheet. In this way the pastry brush doesn’t have to be used. Put on the baking sheet that was varnished 6 maize tortillas, without overlaps. Sprinkle over the tortillas that were put on the baking sheet, 1/4 tablespoon of salt. Put in the oven the baking sheet and leave the tortillas baking for about 10 minutes, until they are moderately browned and the ends start to bend. Suggestion: Whenever you put refried beans on the center of the table also put tostadas – people love to put beans on the tostadas. Variation: The tostadas can also be prepared fried. Did you like the Tostadas? Use “La Banderita Corn Tortillas" to make your tostadas, they will come out delicious. The advantage of using the “OXO Silicone Brush" is that the silicone bristles don’t retain odors, they don’t retain lumps and they are resistant. To bake the tostadas you will need some large baking sheets like the Winware.